It's Friday! WOOHOO! That means a new challenge at Just Add Ink. This week is a sketch challenge brought to you by Design Team Member, Kim. 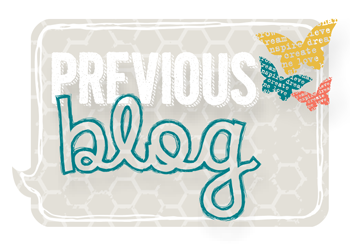 I've got some sneaky peeks for you (if you haven't see them already) ahead of the new Stampin' Up! Annual Catalogue going live next week on June 2nd. EEEEKK!!! So exciting! 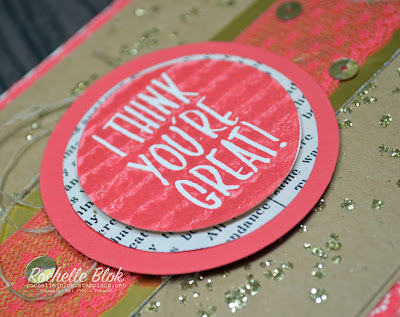 I'm using one of the new 2015 - 2017 In Colours - Watermelon Wonder and a new stamp set that we got at the South Pacific Convention, I Think You're Great. 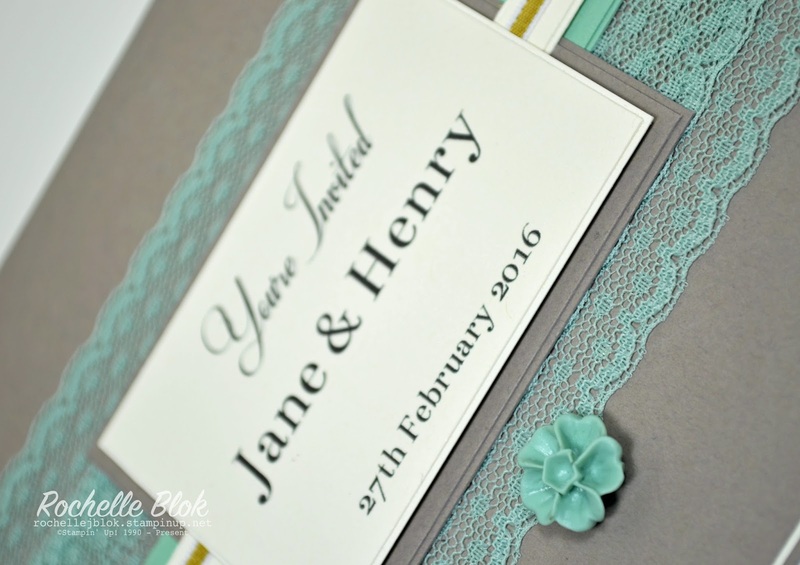 The Watermelon Wonder is a bright colour, it's bold and it really 'pops' off the page. I've used a technique called 'Kissing' on the main image. It's an oldie but a goodie. I inked up the main solid image that has the sentiment 'I Think You're Great' on in and then used one of the pattered stamps from the set and, leaving it uninked, kissed it against the inked stamp. This then picks up some of the ink on the inked up stamp and leaves the image from the uninked stamp. It really is quite easy and gives a great effect. And as we were told at convention, every time you 'kiss' the stamps together you must make the kissing sound. MWAH!! 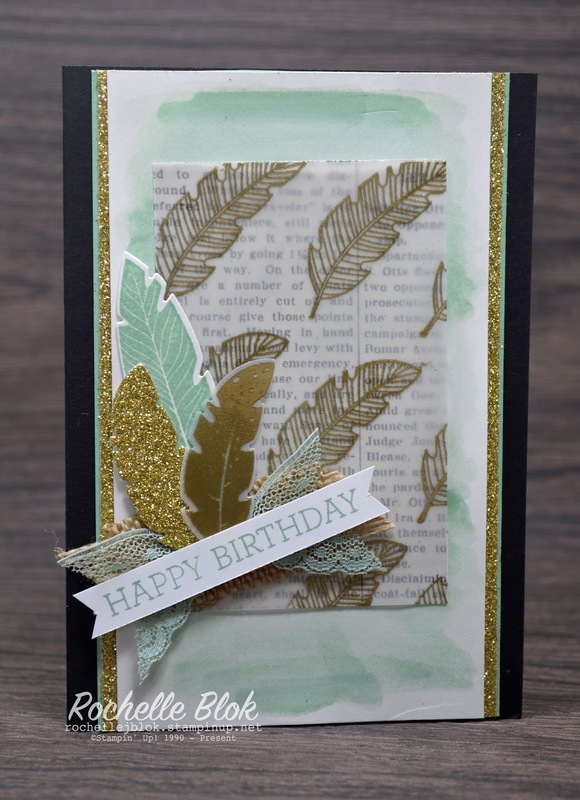 On this card the background is one of the stamps from Gorgeous Grunge. 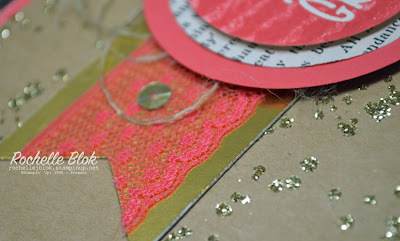 I stamped it with Versamark, pour over heat and stick powder, shook off the excess, heated it up till it became tacky and then poured over the Gold Stampin' Glitter. So sparkly! FYI that stuff gets everywhere!!!!! 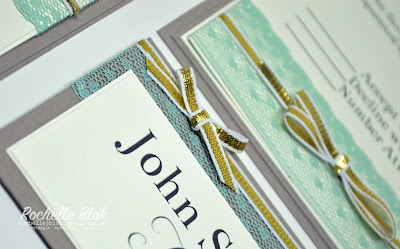 Be sure to check out the other amazing creations from the Just Add Ink Design Team, those girls are just so creative!!!! Make sure you join in the fun and enter your creation! Can't wait to see what you come up with!!! 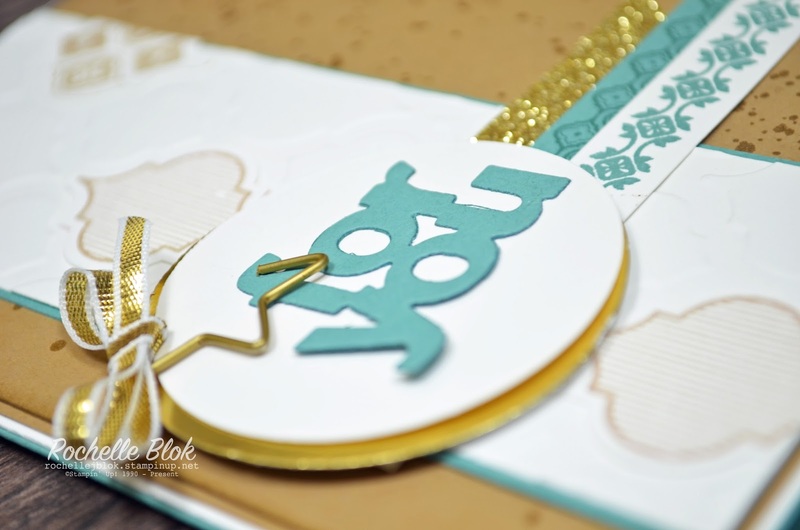 This week at Just Add Ink the challenge, set by Design Team member Jan, is Just Add Wedding. 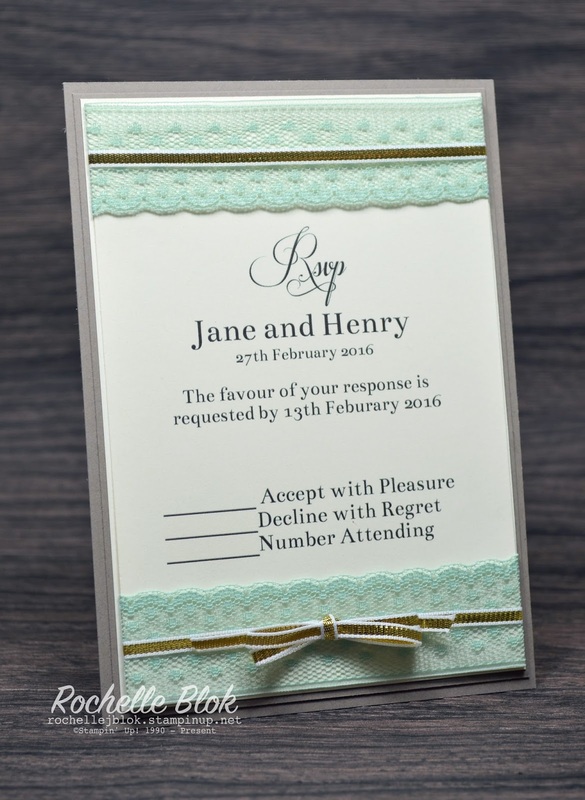 Instead of doing a card for the lovely couple on their wedding day, I saw the beautiful In Colour Dotted Lace Trim (Available 2nd June) would be perfect to make an invitation for a wedding. N.B. All names on the invitations are fictitious. The lace trim is beautiful and gives the invitation a very classy look. I've used the Mint Macron Lace Trim and teamed it up with the new Tip Top Taupe In Colour Card stock and the blossom embellishment is also from the new In Colour range and these are the 2015 -2017 In Colour Blossom Accents. 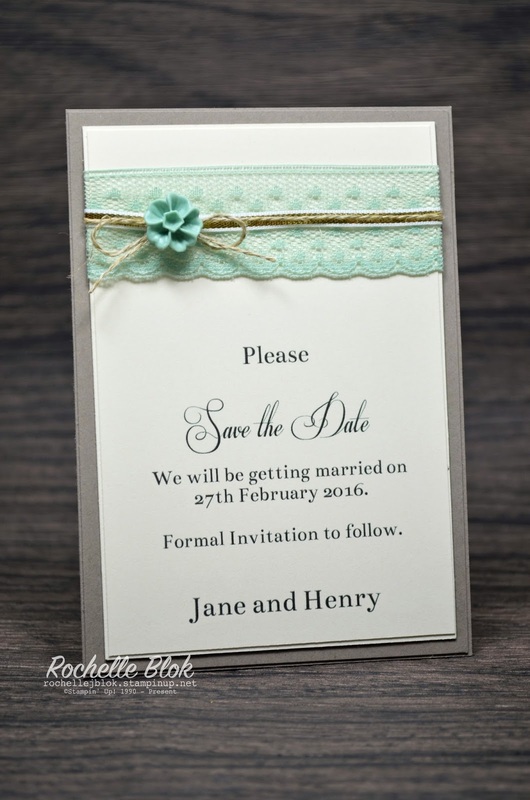 I then though why not make a Save the Date, R.S.V.P card and a table place card, all using the same colours. Simple, classy but very elegant! How cute are those Blossom Accents??!! 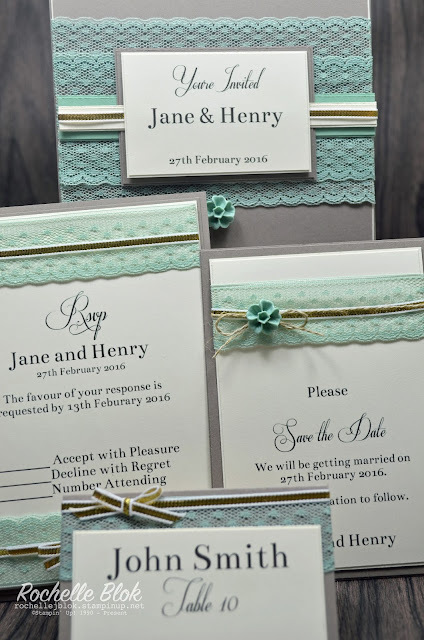 I'm loving the Tip Top Taupe, Mint Macron and Gold colour combination! So beautiful! 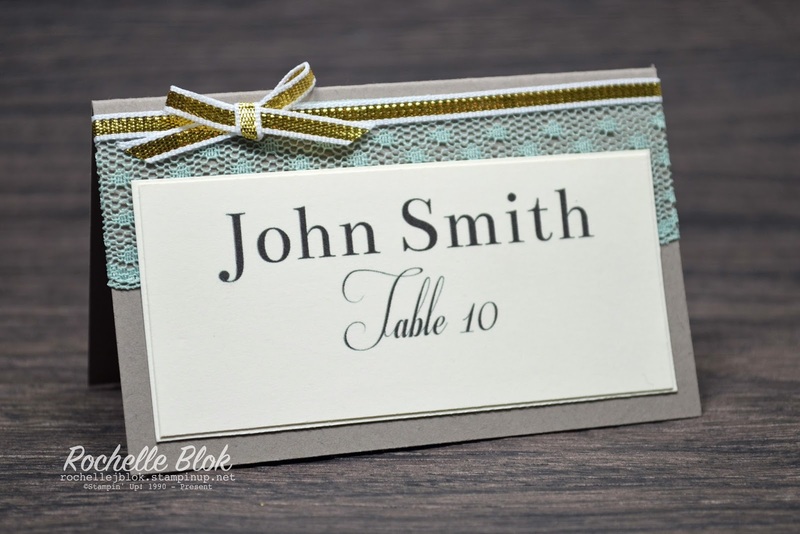 Close up of the place card. Just a few colours and some accent products and you can have yourself some beautiful wedding invites and cards. 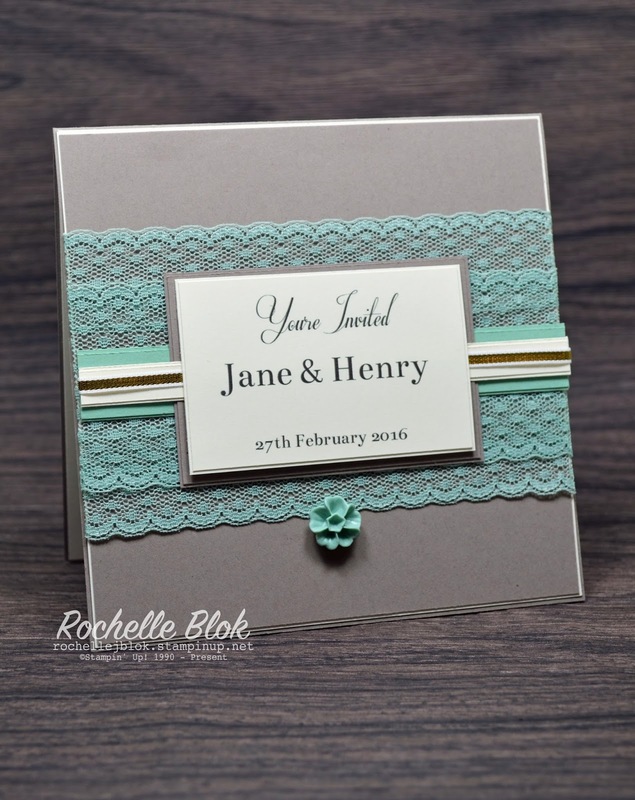 Be sure to check out the rest of the Just Add Ink Design Team and their Just Add Wedding creations and come and join in the fun. It's the third Monday of May so that means it's time for another Stamp Review Crew Blog Hop. 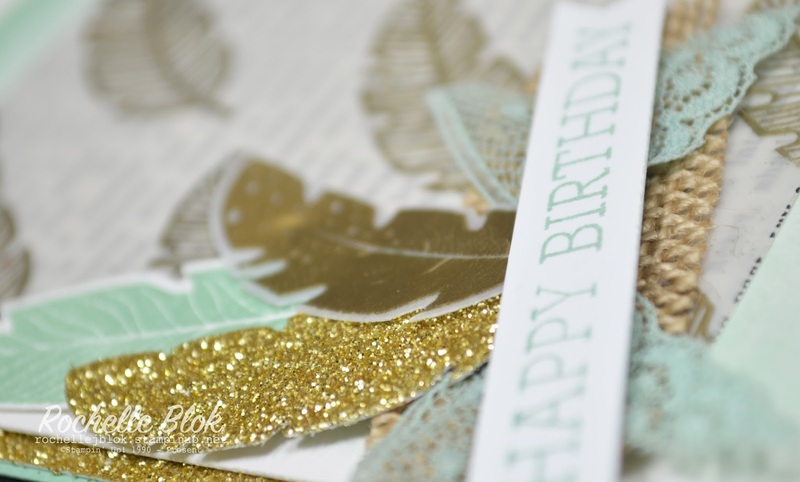 It comes around so quickly each time but I'm so happy to have you here again This hop we are using the Four Feathers Stamp Set. This set also has a matching framelit set so no fussy cutting! BooYeah! 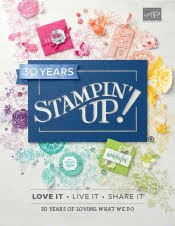 One of the most fabulous perks of being a Stampin' Up! Demonstrator is 'PRE-ORDER'!!!!!!!! This is where demos get to order a select amount of new products before they are released to the general public and have a play and create. 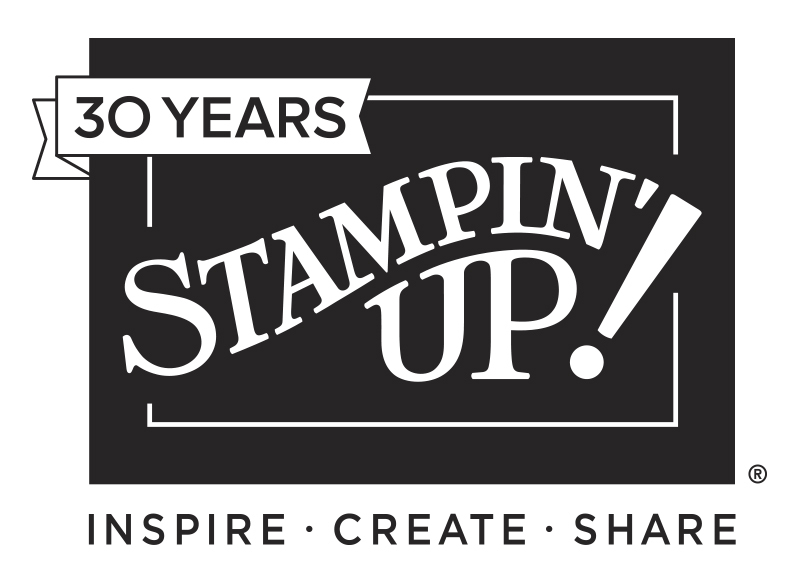 I received my pre-order last week for the new up coming Stampin' Up! Annual Catalogue and some of the products in my pre-order was some of the new In-Colour products. Love them! I've used the new In Colour Mint Macron. I think I've found my new favourite colour! Its so pretty! I did a watercolour wash on the background using an Aqua Painter over White Shimmer Paper. White Shimmer paper is a great cardstock to watercolour on. I repeatedly stamped one of the images on the White Vellum and then heat embossed it with gold embossing powder. So pretty! And then I layered the vellum over the Typeset DSP. Love that DSP! So very happy its in the new Annual Catalogue. 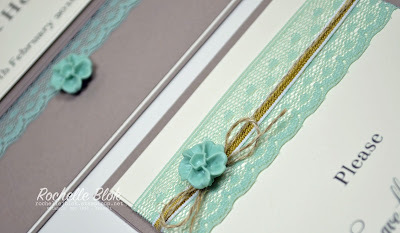 I've finished off the card with 3 of the feathers and then used some of the new Mint Macron Dotted Lace Trim and the Burlap Ribbon to finish it all off! I can see my self using a lot of the new In Colours and a lot of the In Colour Dotted Lace Trim. So purty!!!! 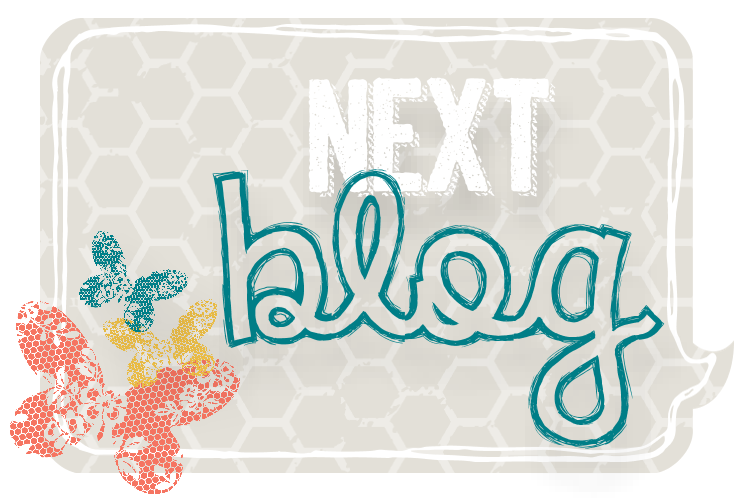 Click on the 'Next Blog' button to move on to the next spot on the hop, the amazing Holly Krautkremer. Please remember to leave a comment as I love to hear what you think of my creations! I hope you've all had a fun and fabulous week. 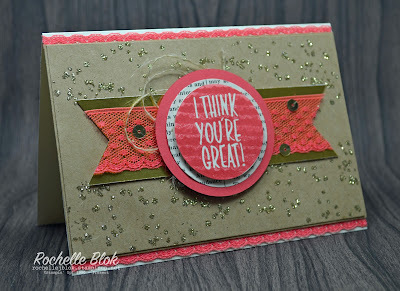 I've spent mine doing a bit of creating and playing (maybe with some new Stampin' Up! products that are due to be released on 2nd June. Watch this space to see some new goodies). 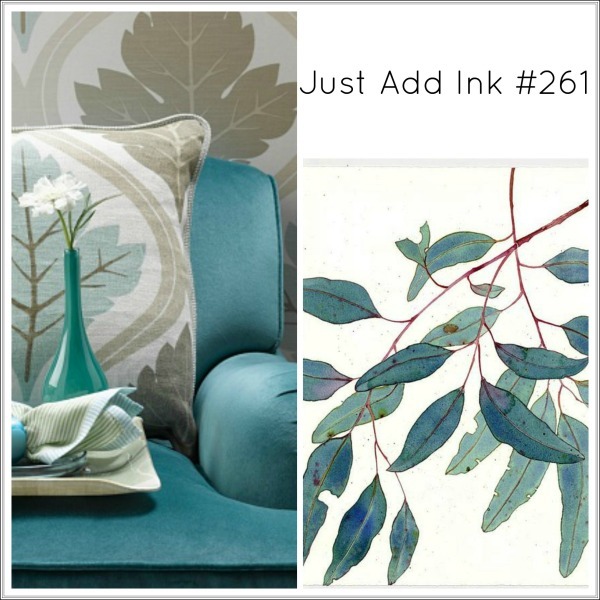 This week at Just Add Ink we have a colour challenge set by fellow JAI member Di. It's not a usual colour combo of mine but I really like it! 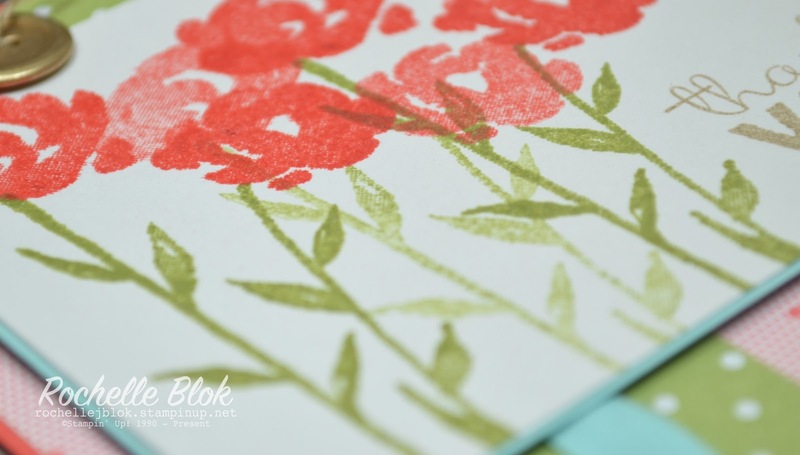 I've had a bit of a play with the Painted Petals stamp set. It's a beautiful set and I've only used a couple of the images from this stunning set. To get the variation in colour I've done whats called second generation stamping. So to get the lighter colour I've inked up my stamp, stamped the image onto scrap paper and then stamped again on my cardstock and it stamps a lighter image. That way you can use one ink pad and get two different colours. 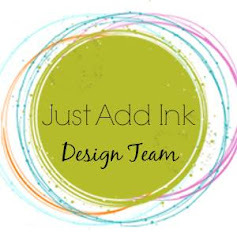 Be sure to check out the other talented Just Add Ink Design Team Members, they are a very creative lot!!! This week at Just Add Ink we have an inspiration pic! Lot's of blues and neutral tones! I must say I really struggled with this pic! I think my I left my crafting abilities on the Gold Coast at the South Pacific Inspire, Create, Share, Stampin' Up! Convention! I was totally inspired there and had so much fun. Maybe it was a bit of a brain overload and I'm not thinking straight! Whatever it was lets hope that now this card is finished my crafting mojo might return. I thought the blue tones looked a lot like Lost Lagoon and then some of the neutral tones looked like Crumb Cake and Baked Brown Sugar. The pattern in the background and on the cushion reminded me of the stamp set Mosaic Madness. All finished off with some gold accents. 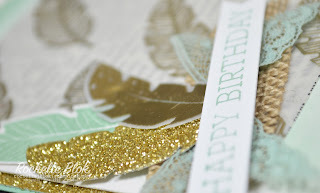 I don't think I can make a card without something gold on it at the moment. Just so pretty! Please excuse the blue smudge on the card. I was pretty much finished, got some ink on my finger and touched the card. Grrr! Just pretend it's meant to be there! Go and check out the rest of the Just Add Ink Design Team creations and come and show us your interpretation of the inspiration picture. It's the first Monday of May so that means it's time for another Stamp Review Crew Blog Hop. 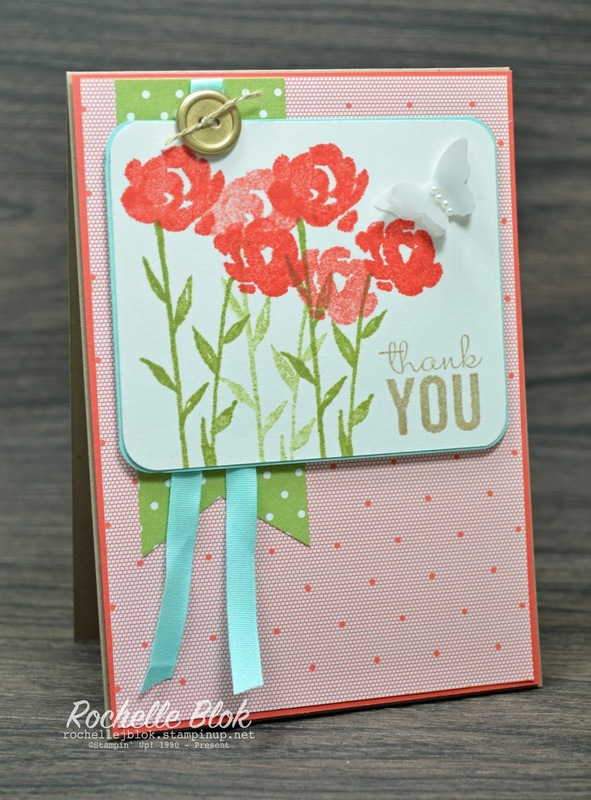 It comes around so quickly each time but I'm so happy to have you here again This hop we are using the Butterfly Basics Stamp Set. I've had a crazy few weeks getting ready for and attending the South Pacific Inspire. Create. Share . 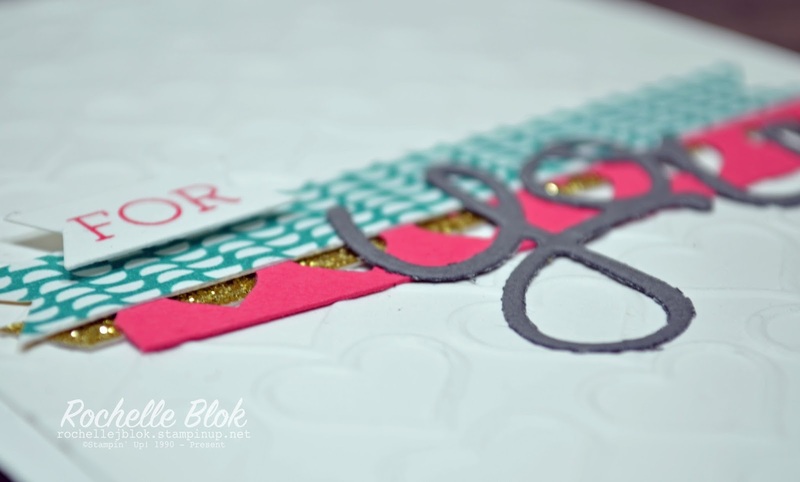 2015 Stampin' Up! Convention. 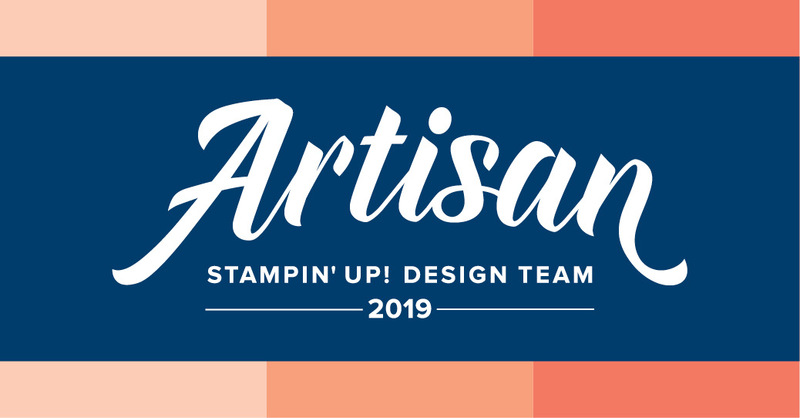 It was soooooooo much fun with all my stamping friends, playing with new products, see the new catalogue, partying away at the awards night, meeting new people, getting stamping ideas, and some great business tips. This edition of the Stamp Review Crew I'm showing one of the swaps I made for the convention. It using some of my favourite retiring DSP - Gold Soiree. That is pretty DSP! 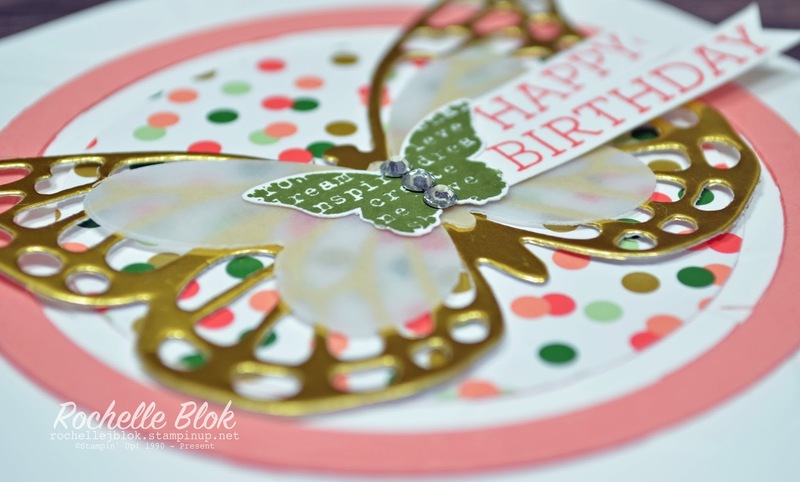 I've only used the smallest butterfly from Butterfly Basics but it's perfect to layer on the Butterfly thinlits. 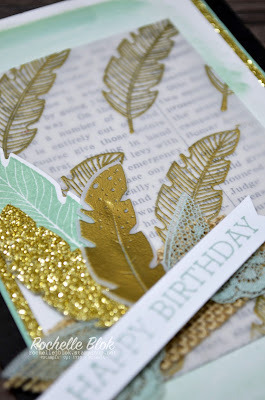 I really love the butterfly thinlit cut out the of Gold Foil Sheets. It's stunning! 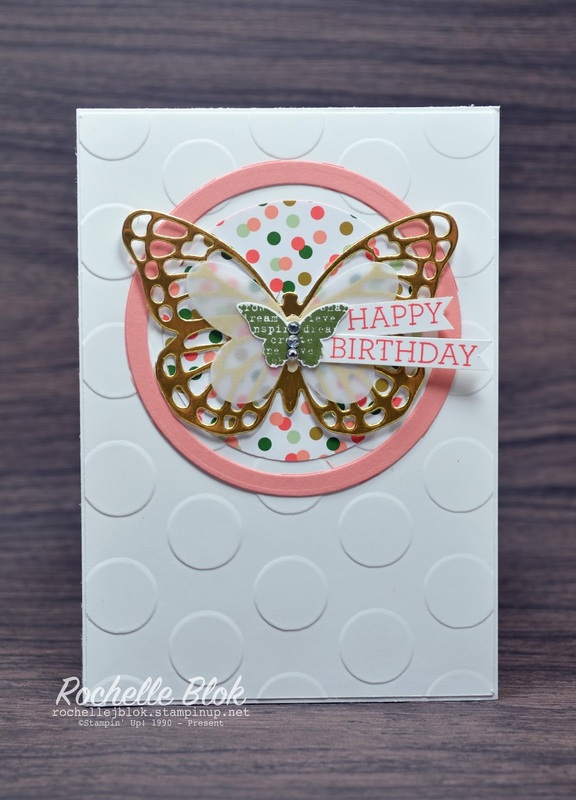 Just a note if you are planning to use the Butterfly Thinlit for a lot of cards or swaps it can be quite tedious and messy to punch all those bits of cardstock out of the holes. Took me ages! LOL! 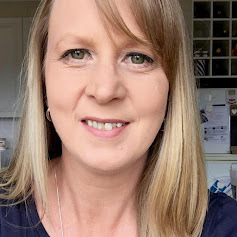 Click on the 'next' button below to hop on to the fabulous Dawn Tidd. This is the second lot of swaps I created for the Inspire. Create. Share . 2015 South Pacific Convention. The Just Add Ink ladies held their own Convention swap and this is the swap I made for the JAI swap. It's a great way to use up scraps that you have just lying around. I've been on the Just Add Ink Design Team now for nearly 6 months now ad this will be the first time that I get to meet them all, those who are going anyway. I'm so excited about meeting my fellow JAI ladies and actually seeing all these creative ladies face to face. I'm really loving the white on white layers at the moment. 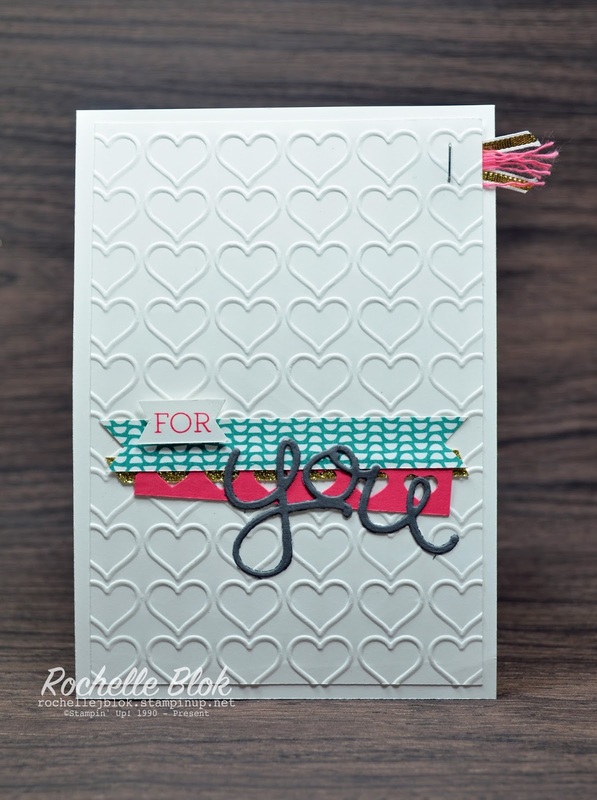 An how awesome does the Happy Hearts Embossing folder look. I love it! Till Monday when I show my last swap!